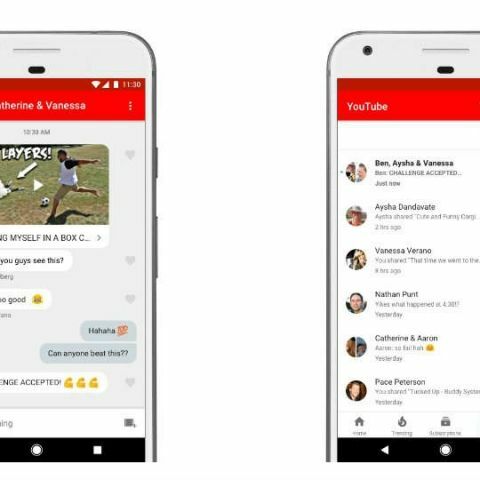 YouTube is rolling out a new feature for its mobile app, which will allow users to chat and share videos from within the app itself. The new feature will not only allow users to share and receive videos from their friends and family, but also chat about the videos, reply with other videos or even invite other people into the conversation. The videos shared on the YouTube app will be availble under a new tab on the app. This should make it easier for users to find videos that were shared with them. “We’ve been experimenting with a better way to share videos on YouTube since last year. Thanks to all your feedback, we made some improvements and are now ready to roll out this new sharing feature to all users globally,” the company notes in its offcial blog. A few days ago, Lyor Cohen, YouTube’s Head of Music announced that Google will be merging two of its music services into a single hub. YouTube Red and Google Play Music would be combined to create a new, stand alone streaming product from Google. YouTube Red is a premium service that is currently available in only five countries, excluding India. The service removed advertisements and allows user to download videos for offline viewing. It also lets users listen to videos with the mobile screen turned off. Google Play Music is available in 64 countries including India and costs Rs 99 a month. Play Music also makes use of machine learning and AI to make song recommendations for its users.